Handwritten cards to promote your business. Appreciate clients by sending handwritten notes. Handwritten Cards and Envelopes have always been and continue to be the most effective way to get information in front of your clients and prospects. Experts all agree that the single most effective thing you can do to grow your business is personal notes, thank you cards, etc… No time to write all those cards? Let us help with our handwriting service. Only ever written by hand with real people. Handwritten correspondence is also one of the most powerful ways of making an emotional connection with your customers to build lasting relationships. A handwritten card differentiates you from most other business. Make sure to give your correspondence that extra personal touch by hand-addressing the envelope and using a real postage stamp too. You now can create notes, cards, thank yous, and follow-ups all in real handwriting from your computer on your stationery or ours and no one will know you used a handwriting service, get started. Contact us about your project. Write the letter shortly after the event that prompts it. Use letter stationery, not ordinary white copier paper. Write with a pen. Keep it short. Use a sincere but professional tone. Get to the point. The first sentence should express thanks for whatever assistance the person provided. Mention why the person was helpful. Include details, if appropriate, such as the occasion, circumstances and date of the assistance. 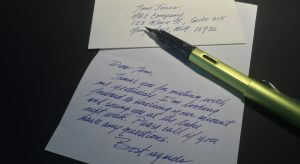 End the letter with another thank-you and “Sincerely” or “Best Regards” followed by your first and last name. Proofread. Mail the letter to the person’s work address or drop it in his or her in-box. Final tip: Don’t sell yourself in a thank-you note. It defeats the purpose.